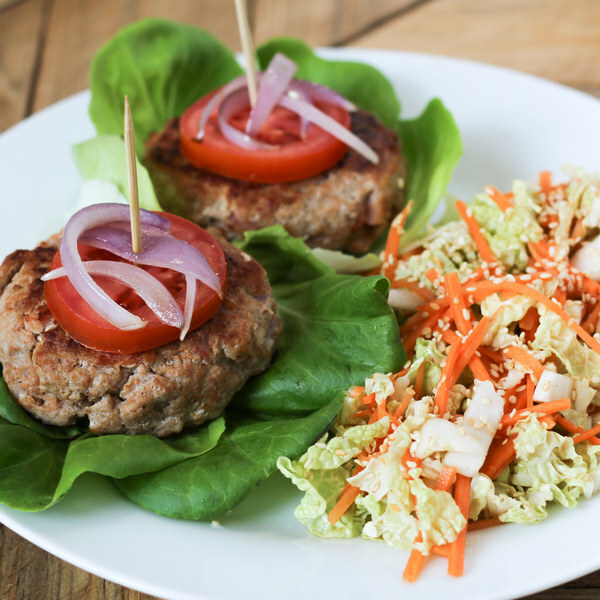 ← Turkey Bacon Burgers with Napa Cabbage & Carrot Sesame Slaw. Peel and thinly slice onion into half rings. Once the skillet is hot, add coconut oil and swirl to coat the bottom. Add onion and, stirring frequently, cook until softened, 4-5 minutes. Once done, transfer onions to a bowl and return skillet to medium heat. In a medium bowl, combine turkey, bacon, paprika, garlic powder, ground cumin, and black pepper. Mix well and form into 8 patties. Place the patties in the skillet; cook until they are cooked through and browned, 3 to 5 minutes per side. Once done, transfer patties to a plate. In a salad bowl, whisk together soya sauce, apple cider vinegar, honey, sesame oil, and sesame seeds. Trim off and discard the root end of the cabbage; halve the cabbage lengthwise, then thinly slice crosswise and add to the salad bowl. Trim the ends and peel the carrot; discard the trimmings and coarsely grate the carrots. Add to the salad bowl and toss to combine. Separate the lettuce head into leaves. Slice the tomato crosswise into ¼-inch-thick rounds. To serve, place each patty on a lettuce leaf and top with a slice of tomato and grilled onions, arrange salad on the side. Enjoy!